teaching from the heart, not the books. 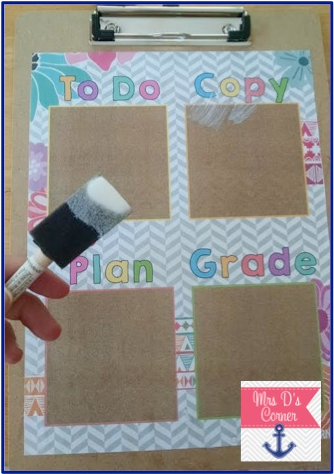 DIY Sticky Note Clipboard + Freebie! I’m absolutely awful at keeping secrets when I am so stinkin’ excited about things I am working on. So I posted this photo to give ya’ll a sneak peek at what I was up to. Well you don’t really need to guess because it’s #MondayMadeIt and I can share with you! Let’s start out with this forever FREEBIE that is now an exclusive blog freebie. If you’re anything like me, you have post it notes all over your desk to remind you of things to do each week. Well I’m putting an end to that mess organized chaos with this Post-It note clipboard! 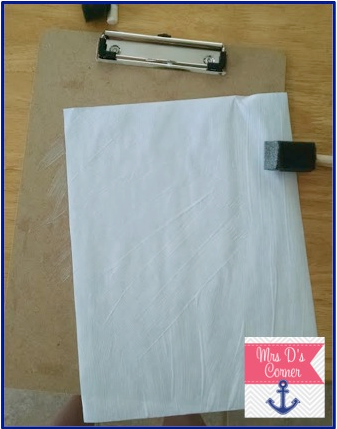 All you need is a sponge brush or a regular paint brush (the sponge brushes are like a quarter at Michaels, so you can just throw them away afterwards and not worry about your paint brush bristles sticking together forever), Modge Podge, the freebie print out, and a clipboard. The cardboard clipboards work much better in this case. I got mine at Target for $1.99. After I cut the white edges off around the freebie page, I used the sponge brush to apply the modge podge to the back of the paper. When you’ve coated the back of the page, flip it over, center it and press it down onto the clipboard. INSIDER TIP * Push from the center out to make sure you get all of the bubbles out from under the paper. The next step is applying the modge podge to the front. Now I’m not sure how modge podge works for non-ink jet computer ink… so be careful with smudging ink and make sure the ink on the page is completely dry first. Once you’re sure the ink is dry, or if you have an ink jet or laser printer (you’re already ready to go!) just apply the modge podge to the front. It will look like this and then dry clear. I put 2 coats of modge podge on top just to make sure it’s nice and evenly coated. Let it dry completely before using and that’s it! …and you can see that even the Super Sticky Post-It notes come right off when you’re finished with a list. 🙂 Tadaa! Such hard work goes in to home remodels!!! It will all turn out beautifully! Cute clipboard! Love the clipboard! And we have a black and white kitchen with white cupboards that have black pulls, too. They really pop and we love them. We did a full addition and take-it-down-to-the-studs redo of our kitchen years ago. Ugh. Not fun to live through. It was SO worth it in the end though. You're gonna love it! Teachers go back end of august, but kids start day after Labor Day. I love the post it clipboard. I am the queen of post it notes but they are always stuck everywhere. This would keep me organized. I love the clipboard idea. I am going to have to make this. I love your kitchen! We go back to school on September 2nd and the kids come back September 4th. I remember our kitchen remodel– lots of take-out and frozen food meals, but we survived! We go back August 6th. Yikes! What a super cute clipboard!! That's a great idea!!! Your kitchen remodeling looks great!! Big projects like that can be so frustrating!! In my district, teachers go back August 18th. Students grades 1-12 return on the 21st. Students in preschool-kindergarten return on the 26th. I hope you have a great year!! July 31st for me, August 6th for the kids! I return to school on Aug 4 and the kiddos will join us on Aug 6 …. Where did summer go? In the words of Olaf … "Bring back summer!" What a cute clipboard!! Teachers go back Aug 21, kids start after Labor Day! 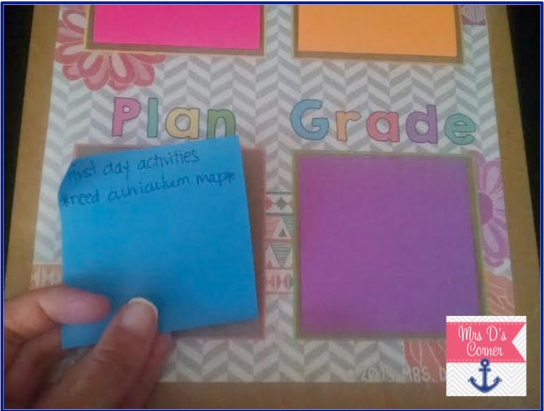 Love the post it note clipboard! Genius idea! I'm keeping my fingers crossed! I just love your style so much and my classroom theme is nautical! I go back to school August 26th and the kids start Sept 2. Teachers go back the 7th of August. Students go back on the 18th! Teachers August 18th. Students on the 25th. 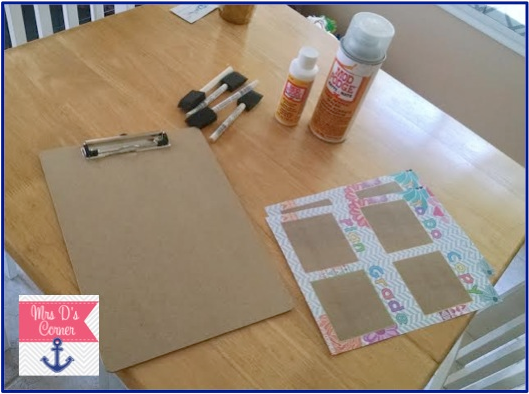 Thanks for explain step by step with pictures how to make the clipboard! I am a person who NEEDS pictures. 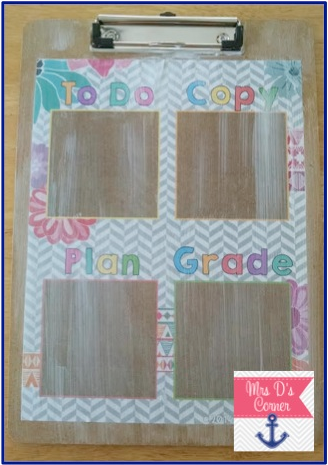 The clipboard turned out so cute and you made it look so simple. Thanks for the giveaway! We go bavk the last week in Aug and students go back the day after Labor Day! We go back on Monday and I'm not ready! 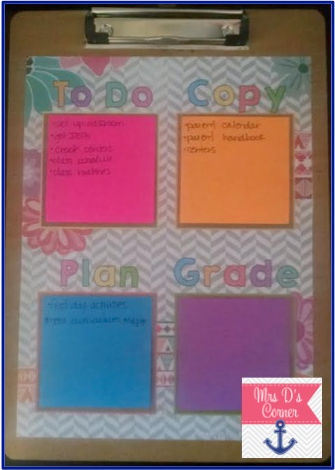 I love the clipboard idea! Awesome! We go back to school the day after labor day! We go back on September 3rd.